Fresh beets, in season from late summer through October, have a sweet flavor and tender texture. While traditionally a garnet-red color, today’s beets are available in golden-yellow, white and red-and-white-striped hues. In addition to serving them as a vegetable side dish, toss beets into autumn salads for extra color and flavor. Select beets that are firm with smooth skins and fresh green tops. Small to medium-size beets are usually more tender and sweet. 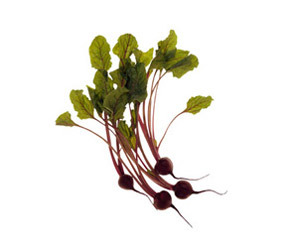 Remove the green tops as soon as possible after purchasing, leaving 1 to 2 inches of the stems attached to the beets. Refrigerate beets in a plastic bag for 7 to 10 days. The greens are more perishable and should be refrigerated in a plastic bag for only 1 to 2 days. For best results, cook beets whole and unpeeled. Gently wash the beets to remove surface dirt, taking care not to pierce the skin. Leaving the skin, roots and stem intact minimizes the color leaching out during cooking. Beets can be boiled, steamed or roasted and served hot or cold. Watch our video for Roasting Beets. After cooking, peel the beets when they are cool enough to handle, removing the roots and stems. To prevent red-stained hands, wear plastic gloves when slicing or chopping cooked beets. Beet greens should be prepared, cooked and served as for fresh spinach. For a simple side dish, simply rinse and drain greens and sauté with a little olive oil and garlic just until wilted, season with salt and pepper to taste. Toss slices of cold, cooked beets into a green salad and top with your favorite KRAFT Salad Dressing. Substitute cooked grated beets for the red cabbage in your favorite coleslaw recipe. Before grating, be sure to not overcook the beets; their texture should be slightly firm for this usage. Roast beets alongside potatoes and other root vegetables for a change of pace. Add a retro flair to your evening meal by serving sliced pickled beets with BREAKSTONE’S® or KNUDSEN® Cottage Cheese!